The only dated works in the exhibition ‘Nasreen Mohamedi: Notes’ at Milton Keynes Gallery are the four pages cut from the artist’s diaries. On Friday 3 December 1971, Mohamedi records: ‘EVE BLACKOUT. WAR BEGINS.’ The words are, however, nearly obscured by the page’s ornamention: over the top of the capital letters are tight rows of ruled pencil lines, occasionally punctuated by coin-sized discs of black ink and filled-in rectangles. Although we are not told where the entry was written, it is unlikely that the blackout and the war were directly connected; while Mohamedi lived mostly in west India, the conflict that began that day was the Indo-Pakistani War, on the other side of the country, which led to the creation of Bangladesh in place of east Pakistan. 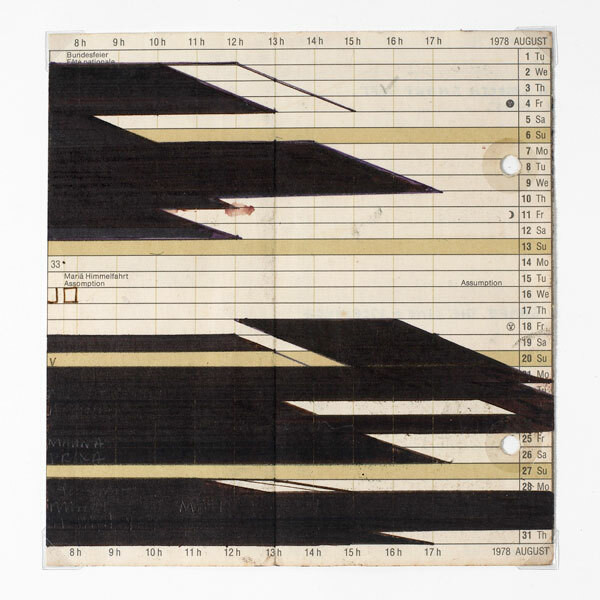 Mohamedi was born in 1937 in Karachi, in what became west Pakistan a decade after her birth. She moved with her family to Mumbai in 1944 and, after studying at St Martins School of Art in London, she travelled extensively in the Middle East and Japan, finally settling in the northwest Indian town of Baroda in 1972, where she lived until her death in 1990. A major frustration for art historians intent on pinning Mohamedi’s work to either a national or a personal chronology arises with the artist’s refusal to date (or title) her works. Broadly, however, they can be arranged into three chapters. Her earliest works, of which a very small selection is shown here, combine collage, expressive brushwork and snatches of figuration, and were made largely in the late 1960s. By the end of the following decade she had entered what Grant Watson (co-curator of a previous, smaller incarnation of this exhibition at the Office for Contemporary Art Norway, Oslo) has termed her ‘classic phase’ – patiently controlled, tautly constructed, repetitive abstractions strung through a fine pencil grid of parallel lines, on sheets of off-white paper approximately 50 centimetres square. Despite starting with the structural constraints of the flat grid, in these drawings Mohamedi gradually works in indications of spatial depth – either through repeated diagonal lines, central vanishing points or shading that implies a receding picture plane. At Milton Keynes Gallery nearly half of the largest space is devoted to these works, placing them opposite ten of her later drawings from the 1980s. In these, Mohamedi abandoned her fixed viewpoint above the grid, creating instead vertiginous perspectives on crisply fractured planes over which the viewer seems to dive, swoop and soar. The analogy is anachronous, but for me they brought to mind the freedom offered by the disembodied viewpoints of virtual reality environments: zooming from micro to macro, or plummeting through and out the other side of grounds and objects. As a culmination of Mohamedi’s evolving language, these later works might be read as actualizations of the impossible: aerial vantage points over pristine, geometric landscapes; projections and expansions of spaces devoid of substance, scale or inhabitants. Many of these drawings bear an uncanny resemblance to plans for Milton Keynes’ shopping centre, inspired by Ludwig Mies van der Rohe and built in 1979, which is situated adjacent to the gallery. Perhaps it is in this respect that Mohamedi’s work responds most clearly to the overwhelming chaos, colour and noise of her contemporary India – by reacting against it, rather than reflecting it. While the Modernist shopping centre was being built, this artist, thousands of miles away, was constructing Utopias in her mind.